Tiana has a pocketful of words: green words like spring, night words like moon, and words with wings, like angel. Each word is the inspiration for a pair of poems—one, lyrical free verse and the other, haiku. The paired poems reflect Tiana’s lively spirit and urban outlook and are showcased in Javaka Steptoe’s inventive collages, which include a wide range of materials, from faucet handles to pumpkin seeds to a hand-sculpted, gilded alphabet. 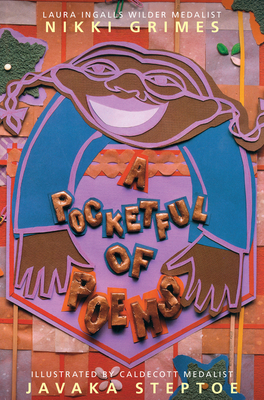 A fusion of two remarkable creative talents, A Pocketful of Poems is an engaging portrait of a down-to-earth girl who has a way with words, as well as a tantalizing introduction to poetry. Author’s note on haiku. Nikki Grimes is a New York Times best-selling author of many books for children, including Bronx Masquerade, which won the Coretta Scott King Award, and Words with Wings, which won a Coretta Scott King Author Honor Award and the Laura Ingalls Wilder Medal. An accomplished poet, novelist, journalist, and educator, she was born and raised in New York and now lives in the Los Angeles area. Visit her online at nikkigrimes.com and on Twitter @nikkigrimes9. Javaka Steptoe is a Caldecott Medalist, Coretta Scott King Award winner, and New York Times best-selling picture book creator. He has illustrated several books for children, including Jimi: Sounds Like a Rainbow, A Story of the Young Jimi Hendrix by Gary Golio, A Pocketful of Poems by Nikki Grimes, and Radiant Child, which he also wrote. He lives in Brooklyn, New York. Visit him online at javaka.com and on Twitter @javaka_steptoe.